The need for global atmospheric data has never been greater. The costs of natural disasters are soaring as extreme weather increases and population expands, putting more and more lives and property at risk. Meanwhile, smarter and more powerful weather and climate models are hungry for the data they need to produce more precise forecasts on time scales ranging from hourly to decadal. Yet the traditional model for government-funded satellite programs has not kept up with today’s technology and the rising demand for data. Aging spacecraft, budget constraints and schedule delays threaten critical gaps in data crucial to monitoring and predicting day-to-day weather, hurricanes and winter storms, floods and drought, space weather and climate change. Analysis of two recent high-impact weather events demonstrates the importance of satellite data to accurate forecasts and advanced planning. 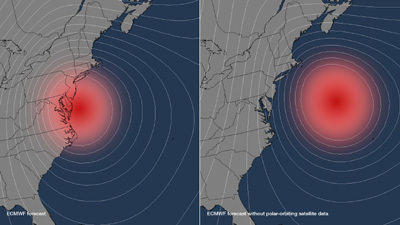 An experiment conducted by the European Centre for Medium-Range Weather Forecasting found that without data from High-Definition polar-orbiting satellites like PlanetiQ’s, the computer model that accurately forecasted Hurricane Sandy would have instead shown the storm staying out to sea, rather than plowing into the Northeast US as it actually did. Without advanced warning, important preparations cannot be made. A similar experiment by the National Oceanic and Atmospheric Administration found that in the absence of High-Definition polar-orbiting satellite data such as PlanetiQ’s, five-day model forecasts for the massive “Snowmageddon” storm that buried parts of the eastern US with 20-35 inches of snow would have underestimated snowfall by at least 10 inches. As severe as the impacts were from both of these storms, they undoubtedly would have been much worse without the forecast accuracy and lead time made possible by our data type. PlanetiQ represents a new model of collaboration between public and private stakeholders, one that leverages private funds to augment government systems with commercial data at a lower cost and with less technical and financial risk, in order to sustain and increase collection of the environmental data required for accurate forecasts and informed decisions. PlanetiQ is launching a constellation of about 20 small satellites that will provide more than 400 million observations per day for weather and space-weather forecasting, as well as climate monitoring. The data is generated by GPS signals interacting with the earth’s atmosphere, and being captured and analyzed by our highly-proprietary satellite-borne sensors—this is called GPS Radio Occultation (GPS-RO). Our GPS-RO is highly sensitive compared to other versions of RO– we are High Definition. GPS-RO data is already ingested by global forecast models and is among the top contributors to forecast accuracy while also the most cost effective. But only a sparse amount of GPS-RO data has been available to date. 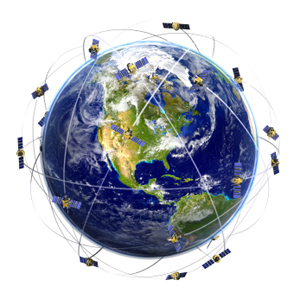 The PlanetiQ constellation will deliver more than 10 times the amount of data provided by GPS-RO satellites currently on orbit, easily making GPS-RO the most important contributor to forecast accuracy. The constellation will be refreshed with new satellites and sensors every few years, fostering innovation and increasing the number and type of measurements made. PlanetiQ was founded in 2012 and is supported by partners with extensive experience in the design, development, testing, integration, operation and management of satellites and space systems. We are veteran insiders in the space industry and environmental science community, and were instrumental in designing the sensors for the COSMIC mission, the world’s first and only satellite constellation of proven GPS-RO sensors. Our team was also intimately involved with the commercialization of satellite imagery in the early 2000s, which not only led to a reliable and affordable supply of high-quality imagery for both military and civilian use, but also jump-started a commercial industry that eventually produced such innovations as Google Earth and the explosion of online mapping. We are using those lessons learned to bring similar benefits to those around the world who need high-quality and cost-effective data for accurate weather forecasts, early warnings and informed decisions.